The link between where you are likely to find a buck’s shed antlers and where you are likely to shoot that buck in the fall is way overrated. In the winter when the antlers are dropping, the buck’s life revolves around food and cover. These are the keys to where he spends his time. 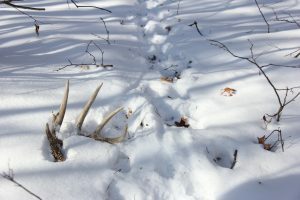 If you are going to find his sheds, these areas are where you should concentrate your efforts. Winter is a rough time for whitetail bucks. They are run down from the rigors of the rut and they need energy to fight off the cold. Foods high in carbohydrates provide quick energy and can easily be stored as fat. The buck’s stomach tells him what he needs to eat and he seeks it out. Corn and soybeans are buck magnets in the winter for this very reason. Find the right foods and you’ll find where the deer are concentrated. 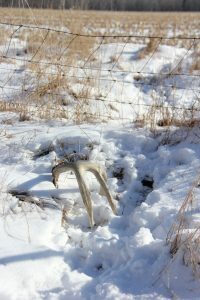 Finding shed antlers is a sport unto itself. The key to locating them is an understanding of how food and cover influences the buck’s daily lives. When the snow gets deep, food can be hard to find, but the tops of hills provide areas where the snow is blown off and the food is easier to access. This is where the deer will feed. My first set of matching Boone & Crockett sheds were found 200 yards apart; one on top of a windblown hill in soybean stubble and the other in thick cover at the edge of the field. I divide the bedding areas into two categories, the first is thermal cover and it’s usually the snarliest, nasty thicket with a quarter mile of the food source. This is where the deer bed when the weather is windy, the snow is blowing or it’s overcast. Thermal bedding cover is often in creek bottoms where the deer can get out of the elements. Corn stubble is a magnet for deer in the winter, and specific areas like where the deer jump a fence can jar loose a shed that’s ready to come off. Shed hunters should pay special attention to these sites. Solar Cover is the type of bedding area the deer will use on sunny days. The southern slopes of hills with open canopy of trees provide them with a place they can see in front of them and smell what’s behind them. They will lie in the openings where the sun’s warming rays can hit them. As the sun moves across the sky they will get up and move out of the shade. The more they move, the more they are likely to drop an antler. South slopes experience earlier snowmelt, allowing the shed hunter a chance to go picking when snow is still covering other areas. The fifth spot seems obvious at first; the deer bed and the deer feed, so look to the trails where these areas connect. But there are high-percentage spots even on the trails. Some of my most consistent shed producers are where the deer leap over a ditch, and where the jump the fences surrounding crop fields. This can be just what it takes to jar a loose antler completely off. Areas with heavy overhanging cover can be hotspots for bone collecting too. Pay attention to where the deer are spending most of their time in the winter, and spend your time looking in these places. You’ll find more antlers per mile by doing so. where do you look in an area thats flat like South Jersey, no agriculture, only oak woods and swamps. We had almost no acorns this year and what fell were gone in a week. where do you find sheds in woods like this? The deer must eat somewhere so they will be bunched up around whatever high carbohydrate foods are available.